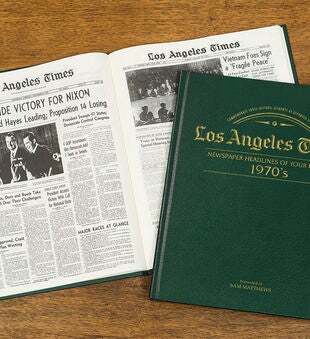 Get a snapshot view of the 1970s with over 100 news reports from the LA Times as events happened. For whatever reason, if the 1970s is your favourite decade then this newspaper book will bring back some fond memories. Over 100 stories, reproduced from original LA Times newspapers, tell it how it happened, as it happened. The Watergate scandal soon takes the public attention away from Vietnam leading to the demise of disgraced President Nixon. The legendary king of rock 'n' roll, Elvis Presley, died after 20 years of chart topping success. This glimpse back at the 70s is bound in a hard back premium green leatherette cover, measuring 12.5”x15” this book makes an ideal gift, reflecting an important decade of history.